PLOT: In an alternate world where dinosaurs were not made extinct, a timid Apatosaurus teams up with a feisty cave-boy to find both his home and his courage. 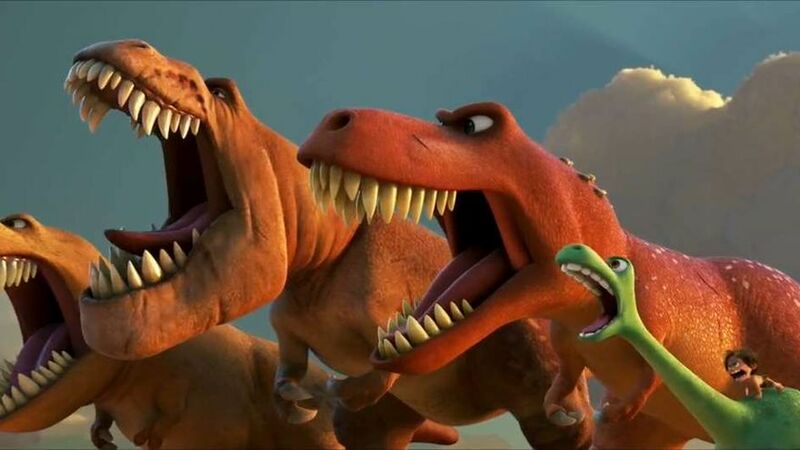 Pixar’s second film of 2015, The Good Dinosaur was conceived in 2009 and has had something of a troubled production. Originally helmed by Bob Peterson and scheduled for release in 2013, the movie ran into a number of behind-the-scenes problems and the director, producer and much of the voice cast was replaced. After such a difficult development period, the film was finally released a month ago, but was it worth the wait? The story begins 65 million years ago with the Earth populated by dinosaurs. A huge asteroid hurtles towards the planet, destined to bring about an extinction level event… but misses! Several million years later, dinosaurs have evolved into intelligent beings that can speak and work together to farm crops and livestock. Humans have also evolved, but are primitive and treated as annoying ‘critters’ by the more advanced dinosaurs. A family of Apatosaurs farms corn along the banks of a great river, and includes Arlo, our cowardly hero-to-be. After an incident with one of the aforementioned critters, Arlo witnesses the death of his father in a great storm, and events conspire to strand the young dinosaur far from home. The only familiar face he finds is the cave-boy he had been chasing, whom he subsequently names Spot, and this odd couple must work together to battle against the elements – and less friendly dinosaurs – to return Arlo to his home and family. As you might come to expect from a Pixar film, the visuals in The Good Dinosaur are stunning. The world that our two heroes walk through is gorgeous, with spectacular mountains, lush forests and vast desert plains. The environmental effects are arguably the star of the show, with wind and rain storms the real antagonists of the picture, along with the great river that is so central to the story. The two main characters are also beautifully animated – Arlo in particular is adorably goofy, and has eyes whose expressiveness rivals even that of WALL-E, Pixar’s greatest creation to date. I also loved the score, composed by Oscar-winner Mychael Danna (Life of Pi) along with his brother Jeff, who bring something new to the table with their first soundtrack for a Pixar film. There’s extensive use of string instruments, which give an organic feel that is almost Western-like at times, and much different than the usual scores you’d expect from the likes of Randy Newman. While the audio and visuals are as good as you’d expect from any Pixar offering, it falls a bit flat where the story is concerned. The main story is a generic and predictable tale that has been around for decades. While the core themes of friendship and bravery are laudable, it’s very much a story that befits most kids films with none of the subtlety or surprise that only adults will pick up on, which is what we now expect from Pixar movies. While the two main characters are good, the majority of supporting characters are either instantly forgettable, or so weird or unappealing that you want to forget them as quickly as possible. The only exception to this is the three T-Rex characters, who are amusing and unstereotypical, and help contribute to one of the movie’s best sequences. The film is also not particularly funny, and is in fact quite scary at times, which doesn’t really make sense when it seems so squarely aimed at younger children. Compare this to Inside Out, which worked on multiple levels dependent on your age and created a rich world occupied by mostly likeable characters, and you can see that The Good Dinosaur is in a distant second place. All in all, this seems like a missed opportunity. There are two great characters in a beautifully-created world, one of the the best the company has ever created in fact, but the story is unspectacular and the idea of dinosaurs and humans living in the same universe is never fully explored. You can’t help but think that this ended up being a rushed job due to it’s problematic development period, and while it provides a relatively entertaining hour and a half for youngsters, it offers little incentive to be watched more than once. It is inevitable that not every Pixar film is going to reach the high standards of WALL-E, Inside Out and Toy Story, and sadly what could’ve been a the start of another great franchise looks more likely to be left buried with Brave and Cars at the bottom of the Pixar shelf. 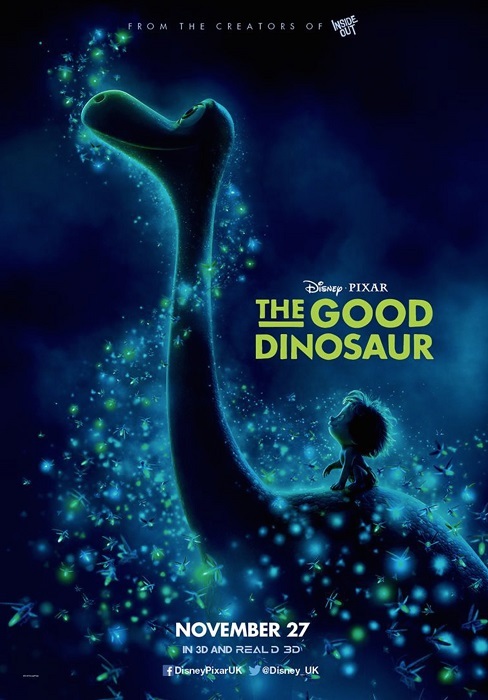 Like all Pixar films, The Good Dinosaur is a superb visual spectacle, but sadly it falls flat when it comes to the story, with the final outcome being something of a missed opportunity that is greatly overshadowed by Inside Out. “I think Mat has been a little harsh on the story here. A world where Dinosaurs were not killed off and have evolved to be intelligent, sentient beings hasn’t been done on this scale before and it is a simple, but significant step away from the predictable robot story that most of these films insist on. Admittedly it is a little light and lacks the adult orientated jokes that we expect for a Pixar script, but the characters are delightful (especially the adorable Spot) and the world that the animators have created raises the Pixar bar once again.